About Arkansas Oklahoma Gas Corp.
Natural Gas is an important source of energy for America’s homes and businesses. Arkansas Oklahoma Gas Corporation (AOG) is privileged to provide energy to our customers in Arkansas and Oklahoma by transporting natural gas through a network of underground pipelines. Year after year, pipelines prove to be one of the safest and most reliable modes of energy transportation. AOG is dedicated to the continued safe operation of our pipelines for your protection and the protection of the environment. We are committed to an outstanding safety record. We maintain 24-hour surveillance and perform routine inspections, computer monitoring, corrosion protection, maintenance/testing programs, and employee training. AOG works hard to maintain the integrity and safety of our pipeline systems. We stay in touch with industry and government organizations to monitor potential threats and study new technologies that will help keep our facilities as safe and secure as possible. AOG will operate, and maintain the facilities in accordance with applicable Federal pipeline Safety standards established by the Department of Transportation. These regulations are intended to protect the public and the environment and to ensure pipeline integrity and safety. Some segments along transmission pipelines have been designated as High Consequence Areas (HCA's) and supplemental hazard and assessment and prevention programs (called Integrity Management Programs) have been developed. 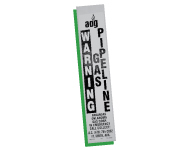 AOG operates natural gas pipelines ranging from ¾-inch to 12-inch in diameter and at pressures from ounces to several hundred PSIG. An odorant is added to all AOG pipelines and facilities. 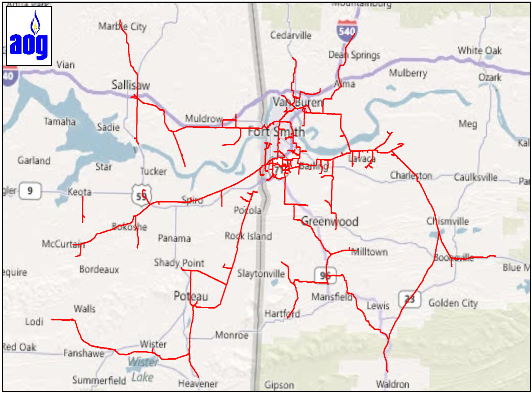 AOG serves Crawford, Sebastian, Franklin, Yell, and Scott counties in Arkansas and Sequoyah, Latimer, Haskell, Le Flore, and Delaware counties in Oklahoma. The U.S. Department of Transportation requires the use of signs to indicate the location of underground pipelines. Markers like these are located at road, railroad, and navigable waterway crossings. Markers are also posted along the pipeline right-of-way. 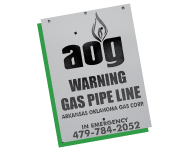 The markers will say "Warning Gas Pipeline" and will have AOG’s Name and Phone Number where we can be reached in the event of an emergency. Markers only indicate the approximate location of the underground pipeline. They are normally not placed directly on top of the pipeline. It’s a federal crime to remove or deface a pipeline marker sign. Safety is Everyone's Responsibility. Pipeline marker signs are important to public safety. Because pipelines must cross the countryside to deliver products over long distances, the pipeline has many neighbors. The pipeline crosses under creeks and rivers, highways and roads, farmers’ fields, parks, and may be close to homes, businesses or other community centers. Written agreements, or easements, between landowners and pipeline companies allow pipeline companies to construct and maintain pipeline rights-of-way across privately owned property. Most pipelines are buried below ground in a right-of-way. The working space needed during initial construction may be temporarily wider but the permanent right-of-way width varies depending on the easement, the pipeline system, the presence of other nearby utilities and the land use along the right-of-way. Many of the rights-of-way are 50 feet wide, but may be wider or narrower in specific locations. These rights-of-way are kept clear to allow the pipeline to be safely operated, aerially surveyed and properly maintained. Pipeline companies are responsible for maintaining their rights-of-way to protect the public and environment, the line itself, and other customers from loss of service. This includes keeping rights-of-way clear from encroachments of any kind including buildings or structures built on top of AOG facilities. 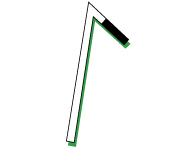 While permanent pipeline markers are located at roads, railways and other intervals along the rights-of-way, these show only the approximate location of the buried pipelines. The depth and location of the pipelines vary within the rights-of-way. you hear an unusual hissing or roaring sound along a pipeline ROW. We are currently conducting a public awareness survey. Your response will allow us to measure the overall understanding of pipeline safety in America, and assist in the continuous improvement of our communications.